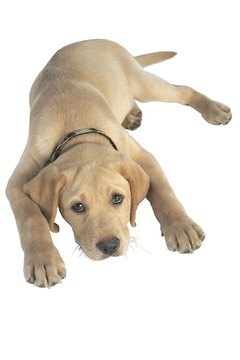 The parvovirus is a life-threatening infection that attacks the lining of a puppy's intestine. Initial symptoms of the parvo include a high-grade fever, followed by decreased appetite, weariness, vomiting, and bloody diarrhea. If treated in a veterinary clinic, the puppy will receive symptomatic treatment to maintain the body fluids, body temperature and balance electrolyte levels. The expensive clinic costs can be avoided to those willing to spend up to 72 hours giving their puppy constant care and attention at home. Take the puppy's temperature regularly with a digital thermometer. The normal temperature for a puppy is 100.5 to 101.5 Fahrenheit. A low temperature requires the chilled dog to be covered with a light blanket and offered warmed fluids. A high-grade fever can lead to dehydration or indicate a secondary infection. Puppies with a fever should not be fed solid foods. Check the color of the puppy's gums. Very light pink, white or grayish gums indicate dehydration or worms. Perform a hydration test on the puppy's skin by pinching it; if it returns back into place immediately the puppy is hydrated. Purchase and slowly administer organic herbal food supplement through enemas to dehydrated puppies until the he keeps fluids down orally and is hydrated again. Herbal food supplements are available online and in pet stores. Reintroduce the puppy to fluids, such as those used to rehydrate and replenish a child's fluids and minerals. Products can be found in the baby section of grocery stores and pharmacies. Offer small meals consisting of plain yogurt, scrambled eggs, cooked chicken, rice, ground beef and turkey throughout the day. Keep a chart to record all pertinent information regarding temperature, diarrhea and vomiting, as well as liquid and solid intake. Antibiotics should be administered to prevent secondary infection. Bring the puppy to a veterinarian, if he expels the enema fluids shortly after administering.